Welcome to the official discussion thread for Ivan "Ironman" Stewart's Super Off Road on the NES! To start, please add this game to your log, add it to your collection (if applicable), and (when you are ready) rate it using the link above! 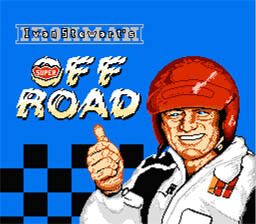 One of the best racing games on the NES, and supporting 4 PLAYERS, Ivan "Ironman" Stewart's Super Off-Road is legendary. A port of the arcade games (complete with a wheel and a gas pedal), no excitement is lost on the way to the home console. Have you played this game? What do you think of it? Is this your only exposure to the Ironman? If you've beat it (after 99 Races), put a score here! Ran 162 races tonight. Man. Hurricane Gulch is still a beast after all these years. Wow impressive, I remember playing Off Road, is Super Off Road any different? I looked up screens and it looks similar. Man those games were hard as balls! I've got Super Off-Road on the SNES. Indeed a fun franchise. Simple and easy to get into. I have always been a big fan of these games. I much prefer playing the arcade version with the wheel and pedal though! That screen really is good, and the music in that game; I've never heard anyone talking about it. So good. Hopefully we can wrangle enough of you dudes for Rochester in '14 so we can break out some 4p action. I got in the habit of seeing when Ivan was on one of his "there is no chance of you beating me" runs, and I just took my time going around the track. At that point, when money is no object, there is no apparent penalty between finishing 2nd or 4th. I always thought that 2nd was BETTER than 3rd (like, you don't lose a Continue or something), but its all the same. Conserve Nitros, live to fight another day. Beat the game. Tell your friends. I can't get the hang of the wheels there. If my Mustang wheel was hooked up, I'd be cruisin'. I think I need force feedback for those, or something. We do have one locally up in the City..
As others can attest, I was a beast at this game at the Emporium arcade bar in Chicago. Total beast mode. Is this the one with the real wheels and gas? Because if so I sucked. I'm usually ok at it. I recall seeing the arcade unit of this game at a local swimming pool when I was very young. At the time it was the most advanced video game I had ever seen, so I was fascinated by it... but never actually played it, just watched other kids do so. I've always meant to buy the SNES version, but I get the feeling the game doesn't hold up, so it's probably best left as a memory of wonderment. I think I was overwhelmed by something. I'd like to run again at Hot Shots sometime or something. It IS pretty advanced, isn't it? And the game totally holds up, at least the NES version doesn't. I can't imagine the SNES version being "worse." You should be fine! The SNES version is the superior version because it includes the bonus tracks. This is one of those meat-and-potatoes arcade cabs that were everywhere in the late 80s/early 90s. I really liked it, but was never actually any good at it. That's basically all I remember about it. Other than girls in bikinis. Huh. I think they covered 'em up with dresses on NES..